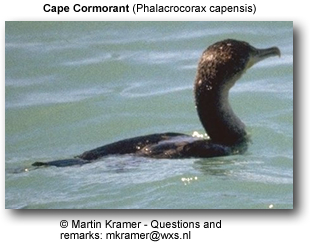 The Cape Cormorant or Cape Shag, Phalacrocorax capensis, is endemic to the southwestern coasts of Africa. Their major predators are Black-Backed Jackals, which take the occasional adult while it is roosting, and nest-site predators such as Great Cormorants, Eastern White Pelicans, and Kelp Gulls. It breeds from Namibia south to southern Cape Province. In the nonbreeding season, it may be found as far north as the mouth of the Congo, and also extends up the east coast of South Africa as far as Mozambique. In the 1970s, the breeding population was estimated as over 1 million in Namibia alone. However, the IUCN now classifies it as "Near Threatened" on the grounds of: ongoing pollution from oil slicks, disturbance to stocks of its prey, and pathogen or parasite increases. 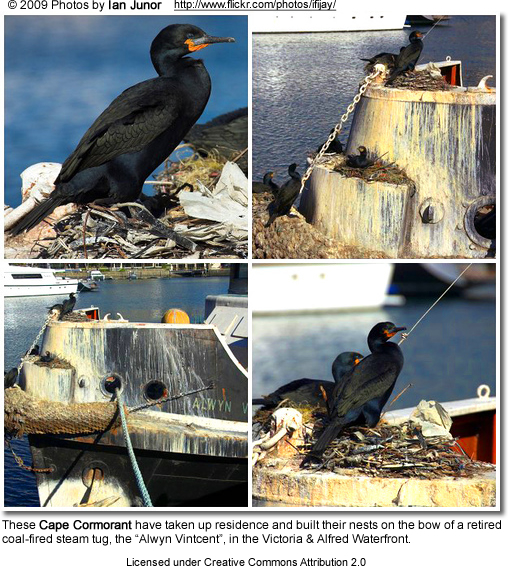 The Cape Cormorant is an almost entirely glossy black bird, though in breeding condition it has a purplish tinge and a few white plumes on head, neck, and cloacal areas. 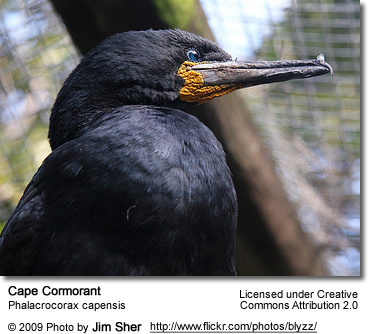 Its gular skin is a deep orangey yellow; unusually for a cormorant, its lores (the regions between the eyes and bill on the side of a bird's head) are feathered. The bird's wing is about 240-280 mm in extent, and it weighs 800-1600 grams, with little sexual dimorphism..
Cape Shags commonly forage in flocks, taking schooling fish from mid-water, such as pilchards, anchovies, and sandeels. 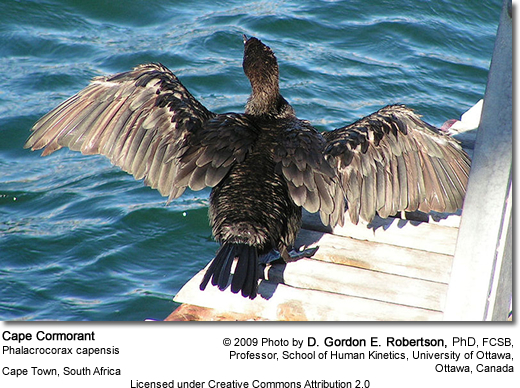 Its prey are typically much smaller than those of the sympatric (of the same geographic region) Bank Cormorant.